Looking for web design, custom software, marketing solutions or mobile apps in South Africa? If you are looking for any or all of the above, Netgen has an experienced team of I.T. specialists with a diverse set of skills to offer clients, designing cutting-edge web solutions that are delivered on time and within the budget of every client, big or small! 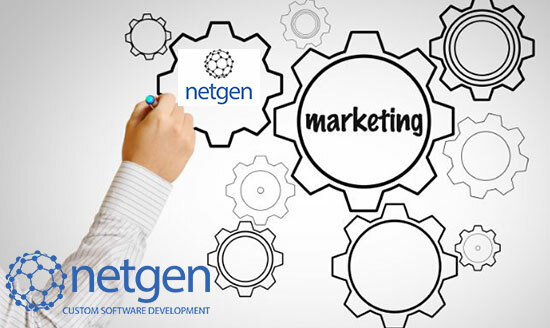 Netgen already has an impressive repertoire of software products and solutions designed to make life easier on the go. These include software programs such as Track Easy, Send Easy, Swim Central, Ecostat and Club Central, each designed to streamline processes for a variety of businesses, giving clients complete control over their own business via online portals. Off-the-shelf software has given way to a major shift towards custom software developed for specific applications in many varied industries. The combined experience of the team at Netgen, active in the web industry for almost 18 years now, offers true professionals who will work hand in glove with you to design custom software that is licenced solely to you. Netgen is committed to developing custom software and providing clients with tools that raise business efficiency and reduce operational costs according to individual requirements. Need to give a tired website a fresh new look? Planning a simple brochure type website or e-commerce site designed with plenty of room to grow? Whatever the answer is, Netgen has a talented team of project managers, technical developers, mobile developers and website developers ready to work with you to design a website perfectly aligned with your goals…..and make sure there’s room to expand as you grow! Mobile apps are fast on the way to becoming a standard business tool in a mobile world, getting in on the ground level now is going to create an even stronger brand awareness for your business in the palms of millions of mobile phone users in South Africa. With a combined 50 years’ worth of experience shared by the team at Netgen, mobile app development in South Africa has become a cost effective, affordable tool to add to a well-designed website that is mobile-friendly. The innovative team of developers at Netgen pay close attention to your mobile app requirements, (designed for Android and iOS operating systems) look at it from every angle and then recommend the best solution to suit your goals and align with your budget. No matter how superbly designed and user-friendly your website may be, or how great the products and services on offer, relying on organic growth alone for your website is going to be fruitless, and if it does happen, it will be a long time coming! This is where Netgen is able to offer an entire range of digital marketing tools and fully integrated online marketing strategies at affordable prices. Netgen will help you to understand the importance of Search Engine Optimisation (SEO) in making you visible in Google rankings, which, along with good content, is the basis for catching the attention of Google and heading for the first page! Other than designing a custom website for your company, Netgen is also able to apply their formidable experience in the web environment to introduce you to the various elements that, when taken as a whole, accelerate the growth of online presence. These tools include setting up SMS and email communications that work seamlessly with your website, blogs (which are the type of content Google loves! ), setting up Google Pay per Click (PPC) advertising and producing organic search engine results. At the bottom line, it’s your business, you know where you would like it to go, and how fast you’d like to get there, and Netgen is ready to tackle your journey to success with their own specialised digital knowledge of the web environment. Sit tight, buckle up and enjoy the ride with the fun team of professionals ready to tackle every project you bring to them for web based solutions from A-Z! Previous PostIs your current software really working for you? Next PostIs it really that important to have a mobile app added to the marketing strategy of your small business?